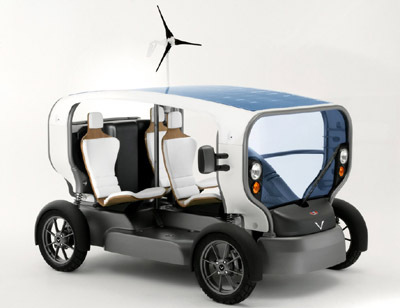 The Venturi Eclectic is a radical concept designed to offer a solution to the inevitable oil crisis and reduce the destruction of our environment. Venturi, based in France, are already at the forefront of production electric vehicles, their first being the Venturi Fetish sports car. - Solar, by way of the photovoltaic cells covering the roof. - Wind power from one or more wind turbines setup on, or around the Eclectic when stationary. 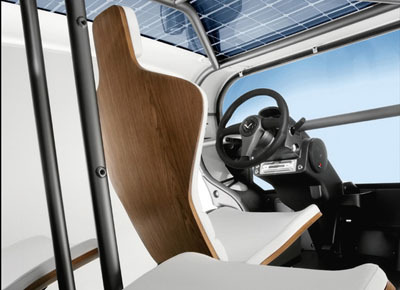 - Electric, by simply plugging the vehicle into the mains electric supply. Top speed for the 3-seat Venturi Eclectic is limited to 31mph. The designer of the Venturi Eclectic, Sacha Lakic, describes the vehicle as: a modern, autonomous and intelligent automobile. The energy that drives it exists all around it : it simply has to deploy its wind turbine, expose its solar cells or, if necessary, find a simple electric plug. It is usual practice to stylise a car. In the case of Eclectic, its contours were born of an approach to design. Its appearance reflects its function. 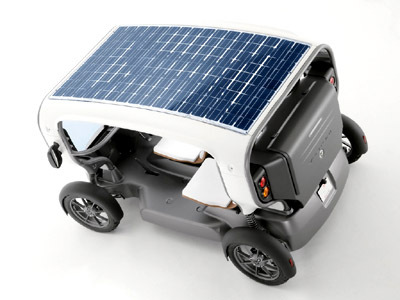 Its silhouette pays homage to certain icon-cars such as the Lunar Rover, Mini-Moke and Méhari. Though its technology positions it clearly in the present and, above all, the future. Initially Venturi plan to build a run of 200 Eclectics for 2007, with a larger production volume appearing in 2009.